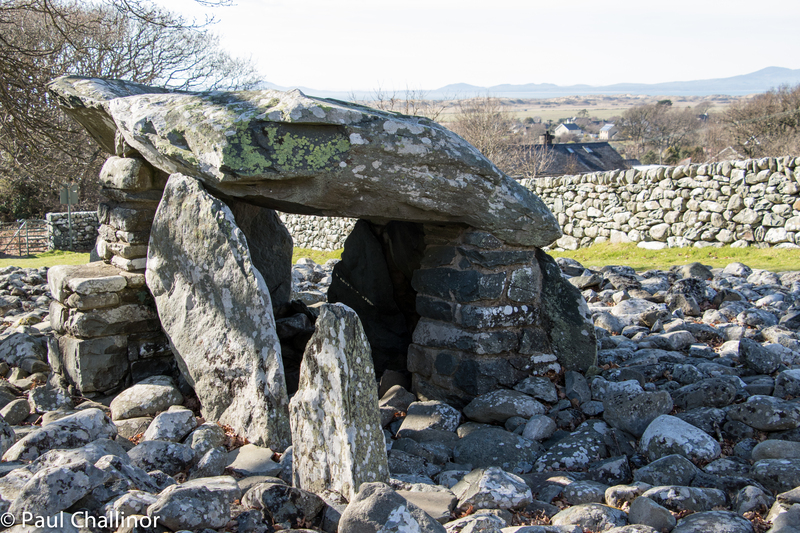 Hidden behind the school in small village of Dyffryn Ardudwy is one of the largest Neolithic ritual burial monuments in north Wales. On a west facing slope it comprises two east-west orientated, portal dolmen-type chambers that open up-slope to the east. The extent of the area that both tombs covered is clearly seen here. The older western chamber is in the foreground. 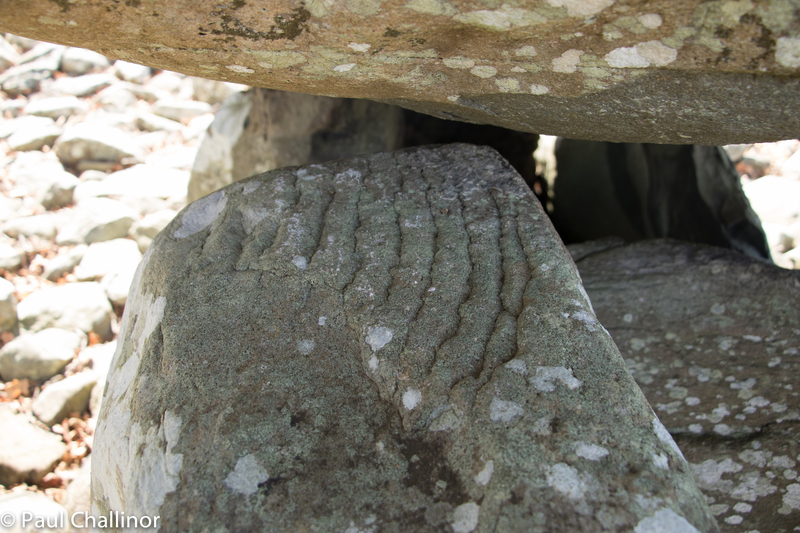 The chambers are set within a well-defined phased cairn, which is roughly trapezoidal in shape and aligned SW-NE. When taken together this is an impressive site, and when covered fully by the stones must have been an impressive sight. One clearly designed to awe the visitor, and emphasise the distinction between the land of the living and the after life. The later and larger eastern chamber. The capstone has had to be supported by a modern column. 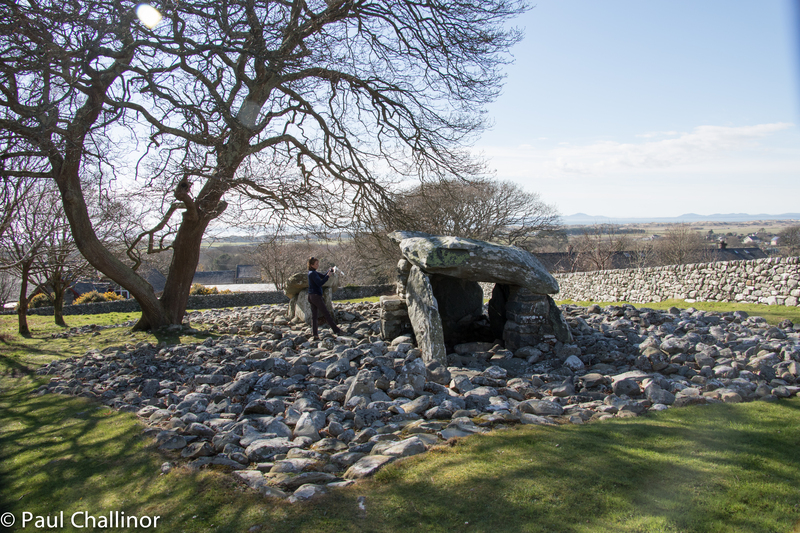 This monument was first excavated in 1960 and was one of the first where multi-period building was recognised and was central to the understanding of the portal dolmen group in the UK and Ireland (1). 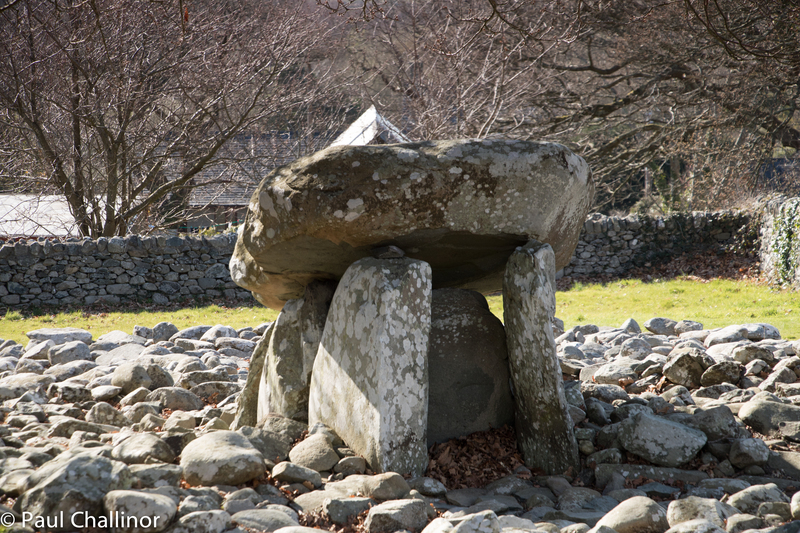 Portal dolmens are the most common type of tomb in this part of Wales. They stand in the centre of farmland, a focus for the community almost like parish churches of today. The forecourts belonging to the two chambers are oriented eastwards towards the uplands of Merionethshire. Smaller and older western chamber. Archeologists have identified two clear construction phases, each phase comprising a chamber and associated cairn. The earliest section of the monument was the smaller western chamber, probably originally a portal dolmen incorporated into an oval or round cairn mound, similar in morphology to nearby Gwern Einion. The first monument phase — the western chamber — comprises a rectangular stone chamber 2.5 m × 1 m which is closed-off with a blocking slab (forming a distinctive H-plan setting). Both the chamber and the forecourt area were enclosed by an oval cairn measuring c. 8.5 m × 9 m. East of the blocking slab are the remains of a well-defined V-shaped forecourt that contained what seems to have been a shallow pit. Within the pit were found Neolithic shards belonging to several vessels. Using Aunty as a measure it’s possible to see the size of the tombs. Although not the largest of capstones, the engineering required was still a major uundertaking. To accompany the earlier western chamber was a larger eastern chamber, located around 10 m to the north-east. 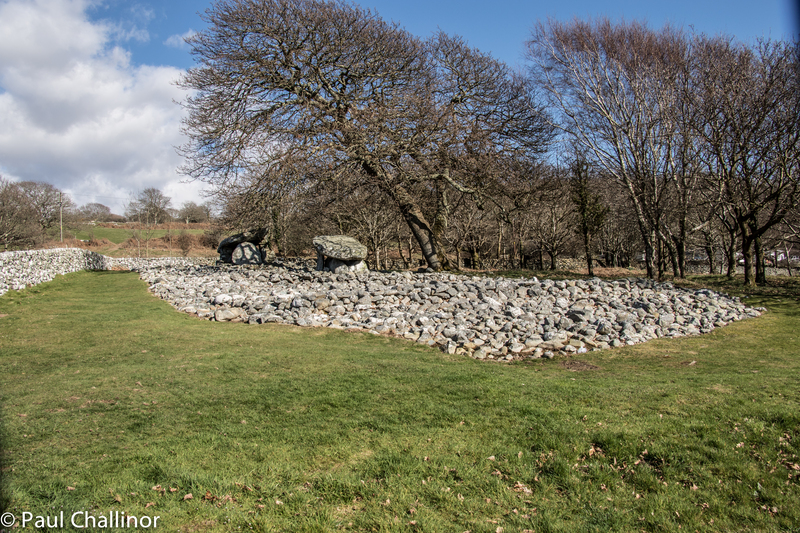 This is a large trapezoidal cairn constructed of rounded boulders made from water-lain local Palaeogene and Neogene rocks (referred to as the Cambrian grits) and measuring 28 m × 15 m, encloses both chambers and the original western oval cairn. When excavated no bones were found in the older western chamber, and those in the eastern chamber came from a Bronze Age cremation burial placed there at a later date. Two small finely polished plaques made from Mynydd Rhiw stone were found in the eastern chamber. Their purpose remains unclear (1).